Don't you love a good ending? I especially love a clever ending, one with an unexpected twist. One that completely changes the story that came before it, where you must go back and see what you missed. 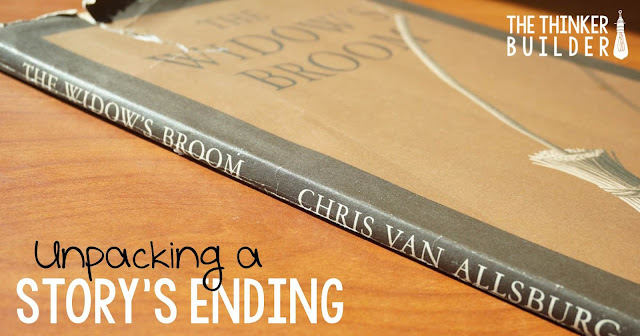 An author who never fails to give his readers an unexpected ending is Chris Van Allsburg. He's well-known for his haunting illustrations, but he's also a master at the mind-blowing ending. 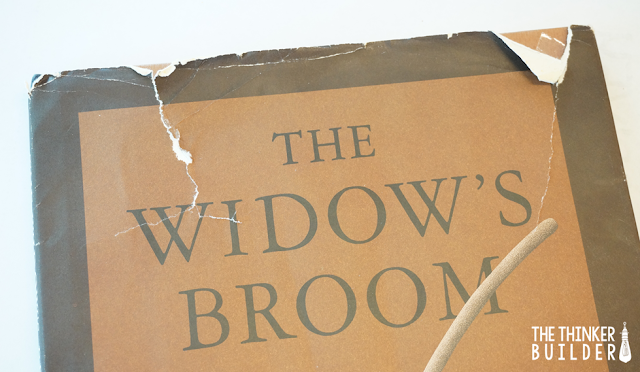 His book, The Widow's Broom, is one of my favorites to read aloud in October. Not only do we simply enjoy the story, but we also "unpack" its ending by going back and digging deep into the text, with two goals: to fully understand the ending and to analyze how the author pulled it off. You can see below that my copy is, shall we say, well-loved. If you've never read the book, it begins with a witch falling from the sky because her broom loses its ability to fly. The witch rests with a widow named Minna Shaw, but then leaves Minna with the broom. The broom has retained some of its magic, and Minna trains it to do chores and keep her company. Minna's neighbor, Mr. Spivey, thinks the broom is dangerous and wants it gone. Instead, Minna Shaw devises an ingenious plan to get rid of the Spiveys, a plan to which even the reader isn't privy until the last page's brilliant reveal. 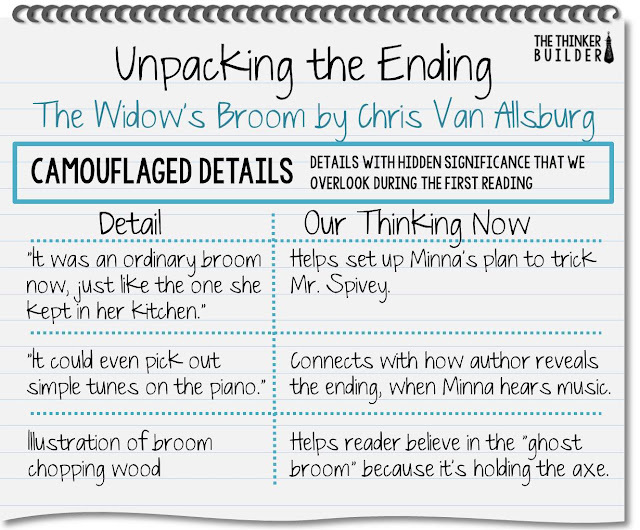 I want to show you the little journey I take with students using The Widow's Broom. Feel free to use this lesson with your own class, or adapt it to use with a different book. The first time I read the story aloud to the class, I try not to get in the way. I take them all the way through the ending. And the few moments right after reading the last line of text, when I close the book and look at the stunned students, are priceless. Cue Mr. Friermood finishing the last page of the book. An Outspoken Student: "Ahhhhhh, I get it. She painted the broom so it just looked like a ghost. That's really trick--"
An Interrupting Student: "Wait a minute! I thought the neighbors burned the broom. How could she paint it if it was burned up?" Cue the wheels turning, the heads tilting, the glances toward the ceiling. A Shy Student with a Good Memory: "Didn't Minna have an old broom? An ordinary one?" Cue the slow nodding, the remembering. Cue the growing buzz of excitement at realizing what Minna just pulled off. Several Students All Talking at Once but Basically All Saying: "So they didn't burn the magical broom. She gave them her old, normal one to burn instead." And Then Finally, a Student After My Own Heart: "Mr. Friermood, go back and show us that page where the neighbors took the broom." Other Students: "Yeah, yeah, read that part again." At this point, about a third of the class has a good idea of what really happened with the broom, another third of the class is getting there, but the final third is still pretty confused, probably nodding their heads trying to fake it. So this is when I begin the little journey with the class, to unpack the ending. And the best part? They initiated it when they asked me to go back into the book! 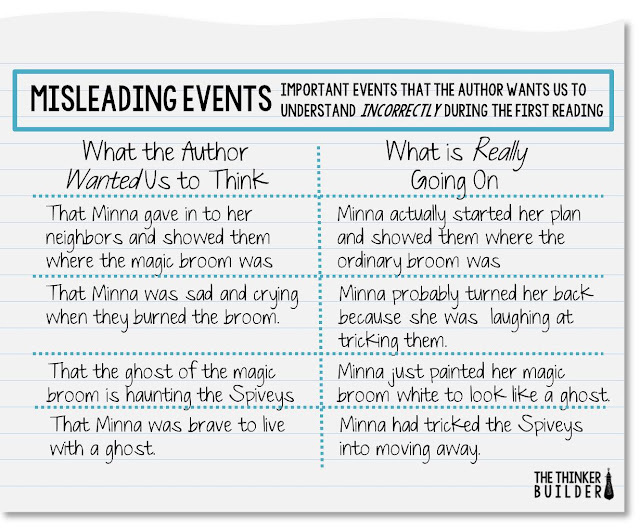 I break out an anchor chart split into two categories: Camouflaged Details and Misleading Events. A camouflaged detail seems unimportant at first. We overlook it. We think it's just one of the many details that surround the "big stuff." We don't realize the significance of a camouflaged detail until after reading the ending. On our anchor chart is a t-chart to record camouflaged details from the story, starting with what is maybe the most important sentence in the whole book. It occurs during one of Minna's first interactions with the magic broom: "It was an ordinary broom now, just like the one she kept in her kitchen." This sentence doesn't mean much where the author has placed it. After all, why wouldn't Minna already have an ordinary broom? But by having the two brooms look alike, the author sets the stage for Minna's clever plan at the end of the story. And it happens right under our noses. We continue to walk through the book and students help locate more camouflaged details, like the detail about the broom playing the piano, and the illustration of the broom chopping wood. 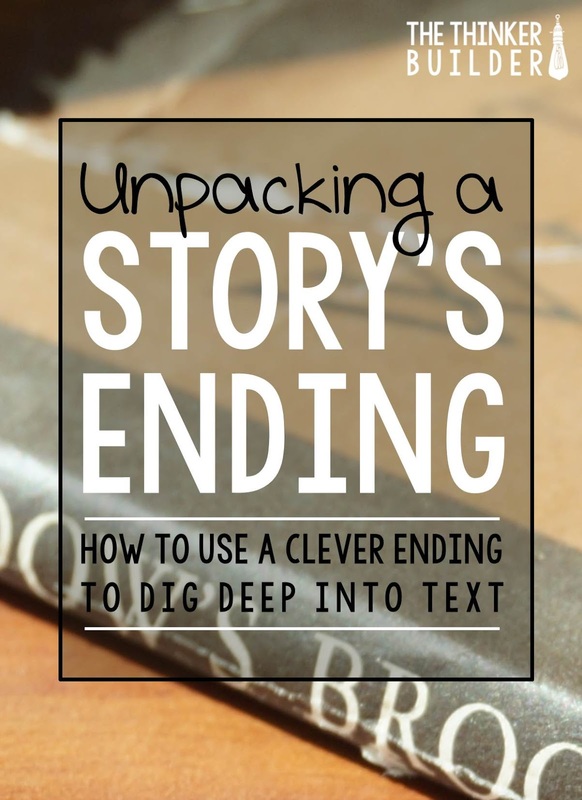 The author: laying the groundwork for the ending. As we approach the last few pages, we switch gears to look closely at the events by which we were misled. These events aren't camouflaged: we know they are important. But we understand them incorrectly at first, just as the author wanted from us. I ask students to be looking for the moment when Minna thinks of her plan to trick the Spiveys. On the page when Minna's neighbors come to take the broom, we zoom in on this part: "There was nothing she could do to stop them. For a moment she stood silently, then answered, 'Of course you are right... we must get rid of it.'" Minna stood silently... We were played like a fiddle, boys and girls. The author made us think Minna was giving in, but really her mind was racing, remembering her ordinary broom she kept in the kitchen, rehearsing what to say in order to trick the men. How fascinating is that? Both interpretations were viable, but the author had camouflaged those other details that we talked about so well that we had taken the wrong bait without a second thought. 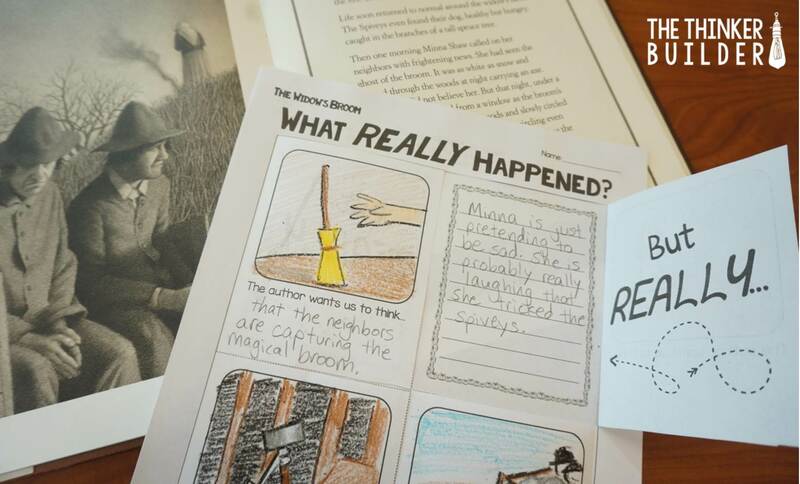 Before we move on, we add another t-chart to our anchor chart, this one split into "What the author wanted us to think" and "What is really going on." We go slowly through the final four pages, each one containing an important misleading event: the burning of a broom, the "ghost broom" circling the Spivey house, and the Spiveys moving out. And we look at each event from both sides. 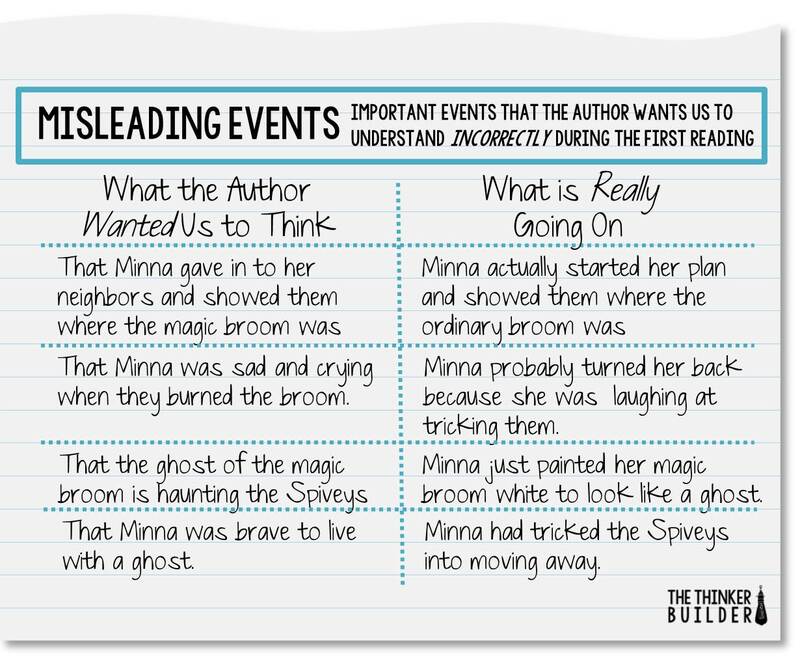 I have students create the Misleading Events chart in their notebook, and after talking through the first couple of entries together, I give students time to record their thinking for "What is Really Going On" on their own before we share. To wrap up the lesson, we discuss the connections between both sections of the chart: camouflaged details and misleading events. I want students to recognize how careful Chris Van Allsburg was in his writing and in his illustrations. One small misstep, one hidden detail that shines too brightly or one event that isn't quite believable enough, and everything falls apart. But with just the right moves, magic happens. A really good ending is a perfect way to take students back into the book for up-close rereadings, for using text evidence to support new interpretations, and for analyzing the subtle techniques in an author's craft. 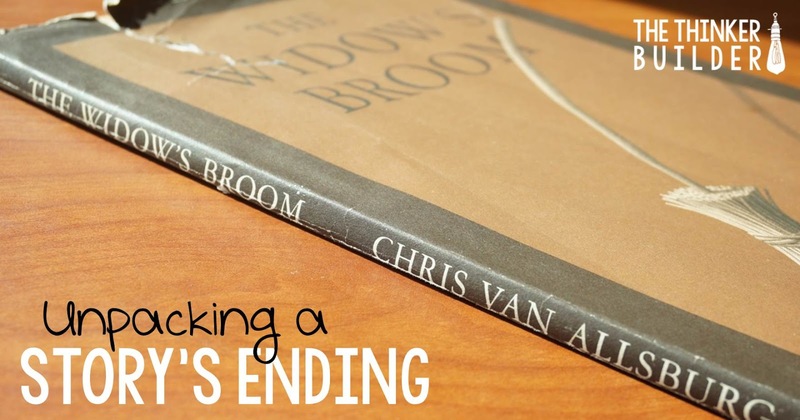 Whether it's a Chris Van Allsburg book or another story, try allowing the ending to be the driving force behind the deep digging you want from your students. 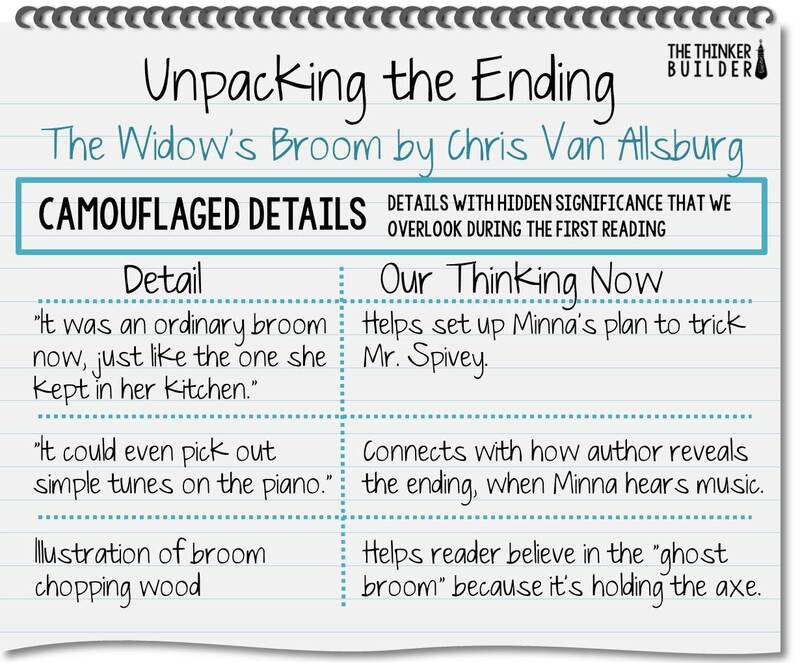 If you are interested in more activities to go with The Widow's Broom, check out my full literature unit, which includes the "Explain the Ending" lesson. The unit contains lessons and activities on character analysis, personification, and vocabulary. It also includes a lot more opportunities and guidance for close reading discussions and written response, as well as some creative and fun activities to go with the book, like holding a "Rally for the Brooms" to support brooms' rights, and designing television commercials for the "Shaw vs. Spivey" rivalry. For more details, or to purchase the literature unit from my TeachersPayTeachers store, click HERE. To see all the literature units I have available, click HERE.